FOUR young performers from east Belfast — Naomi Liberante, Aaron Cathcart, Kathryn Rutherford and Naomi Wilkinson — are part of The Rainbow Factory’s production of ‘Fame — The Musical’ being performed in Belfast. Kathryn has been cast in one of the lead roles, Miss Sherman, a strict English teacher who appreciates the ‘A’s in academics, while Naomi and Naomi play two ambitious students in the Fame Academy New York. Aaron from Dundonald plays Aaron Joe (Jose) Vegas, an outspoken funny guy who is hard to resist and who dreams of making it not only out of the South Bronx but onto the big stage. Around 140 hopefuls auditioned in February and only 30 were chosen to be part of the cast made up of young people from the greater Belfast area. The show will be produced by the longest running musical theatre summer school and best professional youth theatre musical team in Northern Ireland. The young energetic cast have been working tirelessly to give their audiences a theatre experience they’ll never forget. With explosive dance routines and truly ‘West End’ worthy vocals and acting, Fame is one show not to be missed by audiences young and old this summer. Set during the last year of New York City's celebrated High School for the Performing Arts on 46th Street, ‘Fame — The Musical’ is a bittersweet but ultimately inspiring story of a diverse group of students as they commit to four years of gruelling artistic and academic work. YouthAction’s Rainbow Factory was established in 1990 to create meaningful opportunities for young people, especially those who wouldn’t normally have access to youth theatre facilities. It also helps to develop not only their performance and artistic potential but also their personal, social and educational skills through the medium of the performing and allied arts. 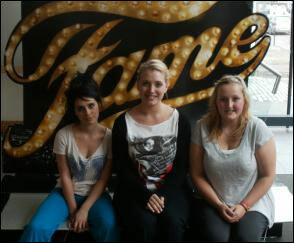 Fame – The Musical will be performed in The Rainbow Factory Studio Theatre, College Square North, Belfast from August 5 to August 14.